Recipients of the inaugural Student Luminary Awards include (from left) Charlie Adams, Colton Harper, Mishala Lewis, Hunter Traynor, Mariah Houston, Ashley Mulcahy Toney, Guari Ramesh, Kai Meacham and Adam Hubrig. Not pictured is Anthony Stephenson. 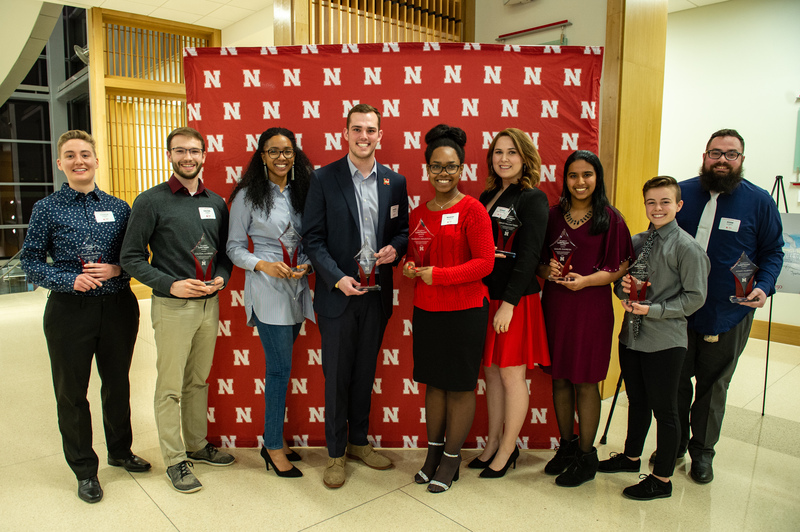 Ten University of Nebraska–Lincoln students — eight undergraduates and two graduate students — earned inaugural Student Luminary Awards at a ceremony March 8. Reframed for the university’s 150th-anniversary celebration, the Student Luminary Awards shine a light on exceptional students who make a difference through their leadership and commitment to improving the campus or community. The Student Luminary Awards replace the Outstanding Student Leadership Awards, making this distinction one of the highest honors presented to students. As part of the award, each recipient receives $1,000. Following is a list of 2019 Student Luminary Award recipients by hometown, with their year in school, major(s) and college. Elkhorn: Hunter Traynor, senior, political science, College of Arts and Sciences. Omaha: Charlie Adams, senior, biochemistry and biological sciences, College of Arts and Sciences; Kai Meacham, junior, biological systems engineering, College of Engineering; Gauri Ramesh, senior, computer science, College of Arts and Sciences; Mariah Houston, senior, sociology, College of Arts and Sciences; Mishala Lewis, senior, sociology and anthropology, College of Arts and Sciences. Wilmington, California: Ashley Mulcahy Toney, doctoral student, nutrition and health sciences, Office of Graduate Studies. Fishers, Indiana: Anthony Stephenson, senior, nutrition and health sciences, College of Education and Human Sciences. Hutchinson, Kansas: Colton Harper, senior, computer science, College of Arts and Sciences. Hankinson, North Dakota: Adam Hubrig, doctoral student, English, Office of Graduate Studies. For more information on the Student Luminary Awards, contact the Office of Student Affairs at 402-472-3755.